Monster can make the partnerships with the sports they sponsor stronger with this kind of cross promotion. Monster Energy has been the title sponsor for NASCAR’s top series since 2017 and throughout the past year and a half, they have done a good job implementing their brand at NASCAR races. But one area where Monster may have been lacking was promoting their involvement with the sport to more of a widespread audience. 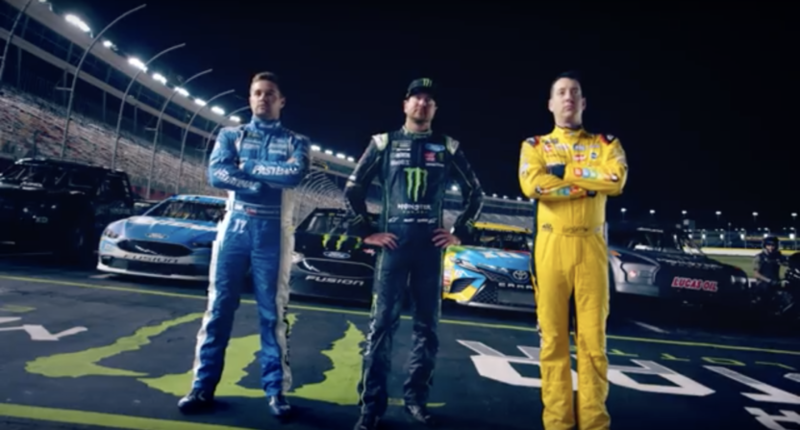 That’s changing in a big way with Monster launching a new ad campaign to promote the Monster Energy NASCAR All-Star Race on May 19. The All-Star Race is one of the most exciting nights of the NASCAR season in which race winners from the past year compete in a non-points sprint race where the winner gets $1 million. For a race this exciting, Monster pulled out all the stops in promoting the race. The trailer features Kurt Busch, Kyle Busch and Ricky Stenhouse Jr. taking their cars out at Charlotte Motor Speedway and being accompanied by Monster-sponsored athletes from other sports, including Supercross legend Jeremy McGrath, X-Games medalists Jeremy “Twitch” Stenberg and Axell Hodges, as well as off-road rider Casey Currie. As the NASCAR drivers come up to the finish line, MMA fighter Quinton “Rampage” Jackson tosses a bag full of money in front of the drivers. In addition to a Twitter conversation that sets up the meeting including everyone incorporated with the ad, the campaign is an original way to show the appeal of a “winner-take-all” big money race like the All-Star Race. Monster’s strategy has been more to cultivate its customer base from within and attracting fans of the sports they sponsor. But what this does is cross-promote Monster’s other athletes and sports into the NASCAR world and not only help promote Monster’s brand, but give the NASCAR audience a glimpse of their sponsored athletes from other sports. That can also be a catalyst for Monster to do this in other sports with NASCAR drivers and help promote NASCAR to a potential new audience, something that can only help a company which is the title sponsor of the NASCAR Cup Series. Here’s hoping Monster does more cross-promotion like this within a variety of sports. By doing that, they could potentially be an even stronger brand and cultivate stronger partnerships with the sports they sponsor.